My review of Elizabeth Flock's Sleepwalking in Daylight appears in the March 15 issue of Library Journal. It's reprinted here, with permission. Copyright © 2009 Cahners Business Information, a division of Reed Elsevier Inc. Reprinted with permission. Great review! I liked "Me and Emma" but I think I'll not bother with this one. Thanks for your comment. Frankly, this was a depressing book with the mother so wrapped up in herself that she couldn't see her daughter's needs. Definitely not my cuppa tea! Thanks for the honest review, Lesa. Very helpful review. If I were a librarian it would clearly tell me whether or not I would want to order the book. You're welcome, Les. I know most of mine are quite positive, but, that's because when I read for myself, I don't finish the book if I'm not happy with it. I'm with you, Kay. I'd rather have a nice murder than a tragedy that the mother is too preoccupied to see. Thank you, Joe. We have to have them nice and succinct for Library Journal. I edit and edit until it reaches the size they want. Hopefully, it then gives enough information for a librarian to make a decision. I respectfully disagree with your review, and hope that libraries do plan to buy this book, despite your review. I loved this book, and couldn't put it down until I had finished reading it. Having grown up in a family similar to the family portrayed in the book, I found this book to be very realistic, and insightful. Yes, it was sad, and I cried at the end, but sadness is a part of life. 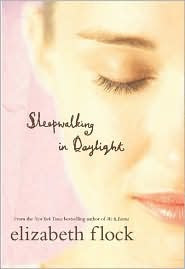 I also read Me and Emma, and loved that book too, but I think Sleepwalking in Daylight is even better. See amazon.com for the wonderful reviews for Sleepwalking in Daylight. Thank you, Linda. I appreciate your honest review of the book, and your referral to Amazon so others can read a different opinion from mine. Thanks for taking the time to write!